BTC’s Take: J.R.C. Ward was a drummer boy until the campaigns of 1864. He eventually became an orderly on General Gibbon’s division staff, but he left the front with most of the 106th PA on July 20, 1864 when their terms of enlistment were up. 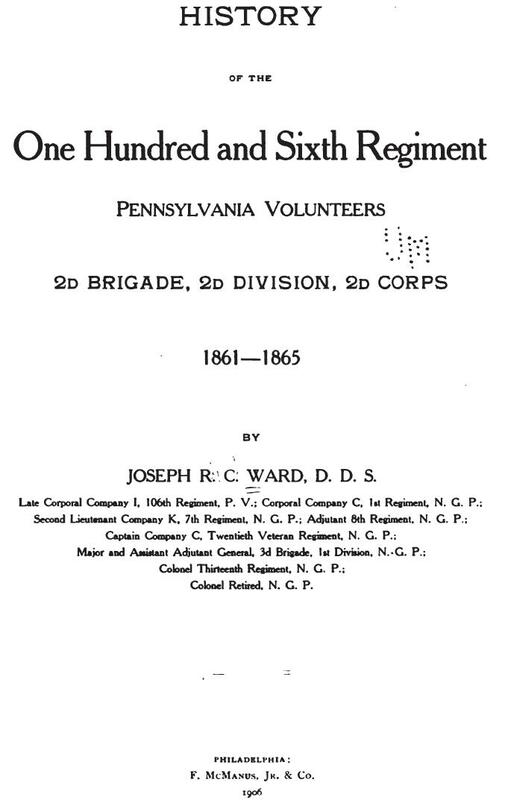 As a result, he does a good job of covering the Siege of Petersburg up until July 20, 1864, but the remaining members of the 106th Pa, formed into a battalion and attached to the 69th PA, do not receive very good coverage in the book, with most of the descriptions being very vague and unsatisfying. The book does a good job of describing the regiment’s experience at the Battle of Jerusalem Plank on June 22, 1864, when all but 12 members of the regiment’s active fighting force were captured as prisoners. This fight was just as bad for sister regiments the 69th and 72nd PA, all members of the famous Philadelphia Brigade. After that battle, the brigade was soon disbanded and lost its identity as 2nd Brigade, 2nd Division, 2nd Corps, Army of the Potomac. Publisher: F. McManus, Jr. & Co.